The first issue of 2014 sees Fireworks #62 packed to the rafters - it looks like it’s going to be a very good year! Foreigner prepare to tour the UK and we have Mick Jones and Kelly Hansen sharing their thoughts on that, their new compilation album and what the future holds for the band. Status Quo prepare to go out with the ‘Frantic Four’ line up one last time and Rick Parfitt gives a very candid interview about the original quartet, the current line up and the Bula Quo movie. 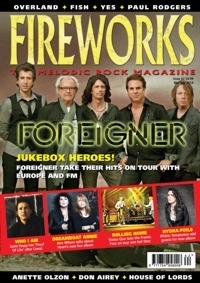 Within Temptation are featured promoting their new album ‘Hydra’, sharing magazine space with other ladies of rock such as Heart and Anette Olzon. The legendary Paul Rodgers gets all soulful with his new album, and ex-Creed frontman Scott Stapp explains all about his ‘Proof Of Life’ album. We welcome back Adrian Vandenberg with Vandenberg’s Moonkings, as well as spending time with Fish, Don Airey, Carl Palmer, Trans-Siberian Orchestra, Yes, House Of Lords and many, many more - 42 interviews in total. So many, we put in eight extra pages for FREE! With the usual in-depth reviews of new albums, live concerts and DVDs, along with dedicated features on books and EPs, Fireworks is amazing value for money and indispensable in helping you figure out what to spend your hard earned cash on!